Life is Just a Cup of Cake has perhaps the prettiest cupcakes in Seoul, but also the priciest ones. 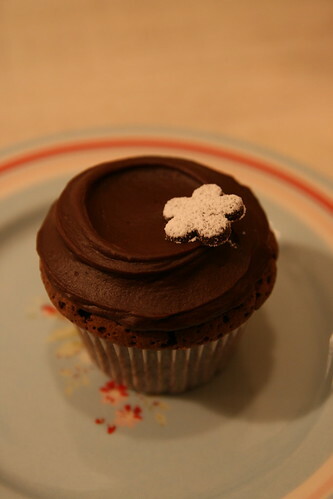 4,800 won for this chocolate delight, a hefty price to pay for this delicious cakey treat. To get there head out of Itaewon station towards Hangangjin station. Keep going past La Tavola, Macaroni Market and the Imperial Palace Boutique Hotel. Take the first left after Caffe Benne and the tiny slice of pricey cupcake heaven is on the right. You can call them on 02 794 2908. Is it nice and moist? I've been craving a good cupcake lately but the ones I've tried have all been dry, which is the cardinal sin in cupcakery as far as I'm concerned. It is moist, but perhaps not quite worth the price.